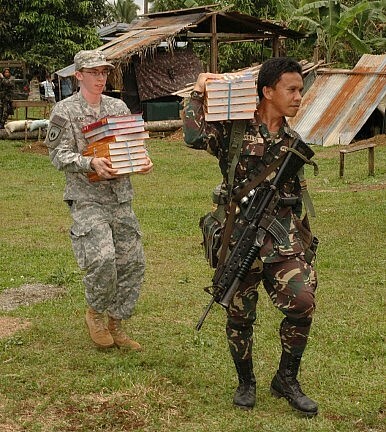 An American and Filipino soldier near a rebuilt school in Basilan in 2009 that was burnt down by the Abu Sayyaf. As the rest of the world grapples with the Islamic State of Iraq and Syria (ISIS), their latest attacks on Paris, and what some commentators are calling the Global Jihad Insurgency, Philippines-based Islamic militant group the Abu Sayyaf may be spreading its own unwanted tentacles. That message was clear following a leaked memo from within the Malaysian police published by the news portal Malaysiakini detailing how the Abu Sayyaf has established cell networks in East and West Malaysia, which were prepared to carry out terrorist-styled attacks. Local police in Kota Kinabalu – where tourist dollars hold pride of place on the local political agenda – denied the reports circulating on social media that eight suicide bombers had been planted in the state of Sabah and another 10 in Kuala Lumpur. But these threats can’t be discounted given the vacuum left by the bloody demise of Jemaah Islamiyah (JI) and its even nastier offshoot Jemaah Ansharut Tauhid (JAT) across the region. Both groups once shared with the Abu Sayyaf in the Philippines’ troubled south. This is unusual as the Abu Sayyaf – who have been widely, and justifiably, vilified as thugs – have largely kept their operations in Basilan, Jolo and surrounding islands, spilling into the Sulu Sea and only sometimes into nearby Sabah, since the group’s inception in 1991. Operational cells in Kuala Lumpur would indicate a major expansion of its operations. Those operations include kidnap and extortion — a major income stream. Group leaders espouse Islamic virtues and have sworn allegiance to ISIS but the few who have had the chance to view them up close and personal tell a different story. Among them is the Australian Warren Rodwell, who was kidnapped by the Abu Sayyaf and held for more than 15 months. He told The Diplomat that kidnapping and extortion were “just scratches” on the surface of their operations. Rodwell said Abu Sayyaf militants prayed when bored and rarely was jihad ever mentioned. Sabah is prone to irregular kidnappings by Abu Sayyaf and has been occasionally embroiled with the rebels who plague the region, contradicting the image espoused by politicians and business. The East Malaysian state has been subject to unwanted travel warnings from Western embassies and the Sabah state government also has a long and menacing history of leaning on journalists who do not toe the official business-friendly story. Nevertheless it was JI – as al-Qaeda’s regional proxy – that wrote the latter day prescription for a Southeast Asian caliphate, detonating bombs across Indonesia with much of the planning and proselytizing done from Malaysia and hideouts in Thailand and Cambodia as well as the Philippines. If the Abu Sayyaf is spreading its wings as an ISIS proxy into Malaysia, a Muslim country with secular pretensions, then fears that the militant insurgency — which dominated the region’s political landscape in the first decade of this century — is making a resurgence will be realized. Just last week Malaysia’s defense minister, Hishammuddin Hussein, said he and other Malaysian leaders were on an ISIS hit list. The Abu Sayyaf is every bit the Daesh — an Arab word meaning ‘a group of bigots who impose their will on others.’ The word is currently striking a chord in the English lexicon following the Paris attacks. As a paramilitary group, the Abu Sayyaf has sworn allegiance to ISIS chief Abu Bakr al-Baghdadi, has outlasted its contemporaries, is well armed, and can make bombs. And that is exactly what ISIS needs if it is to pick-up from where JI and JAT left off in the push for a Southeast Asian caliphate, not unlike the one it seeks in the Middle East. Defense minister warns of linking up and formalization of ties between terror groups.